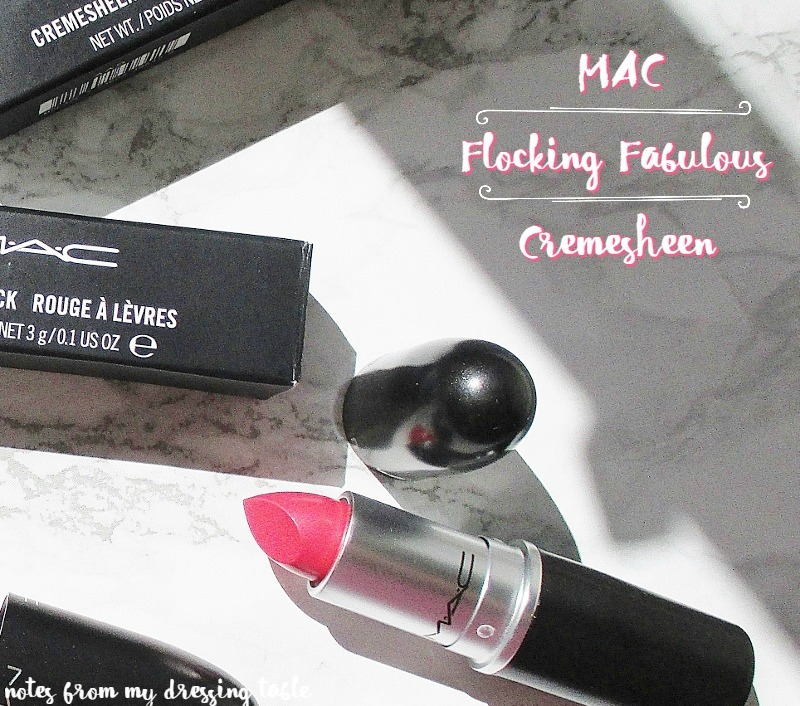 Earlier this Spring, I was drifting around the Nordstrom site, on the hunt for makeups new, fresh and colourful for Spring and Summer when I ran across the MAC Flamingo Park Collection. I have been flip flopping on trying this brand for some time and something about the shades, the names appealed to me so I decided to splurge on some items from that collection and give the brand a test run. MAC limited edition collections come and go so rapidly that unless one is buying core line items or receives them for review ahead of release, it is nearly impossible to do timely reviews so I didn't even try. This post is more about my impression of the product quality, application and wear, rather than a promo of specific limited edition colours. Let's start with the product that seems to be the most beloved of the line. Lipstick. I bought two, in different finishes. Both are housed in MAC's ubiquitous sleek black and silver missile shaped tube with white and black logo printing that feels smooth and fairly weighty in the hand. The cap clicks securely in place to ensure that the lipstick won't become a graffiti artist while knocking around in my handbag. I appreciate good packaging with attention to detail and MAC doesn't disappoint on that score. 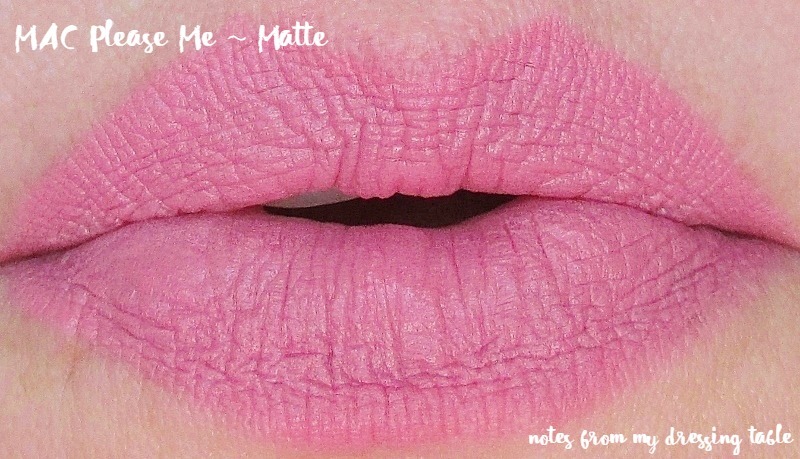 First up, I have Please Me (available as of this writing), a soft, fresh, dusty rose pink in a matte finish. I normally avoid matte lipsticks like the plague, as they tend to murder my lips. When I purchased this lipstick, I went by shade and wasn't paying attention to finish and I didn't realize that I had ordered a matte until it landed on my doorstep. I guess that I could have returned it but my nearest Nordstrom is in Scottsdale so I would have to drive nearly two hours one way to get there. I briefly considered sending it back, since Nordie's offers free shipping both ways but really... All of that raggle baggle just to return a lipstick? Yeah. No. I figured, since I already had the lippie, I might as well give it a chance. 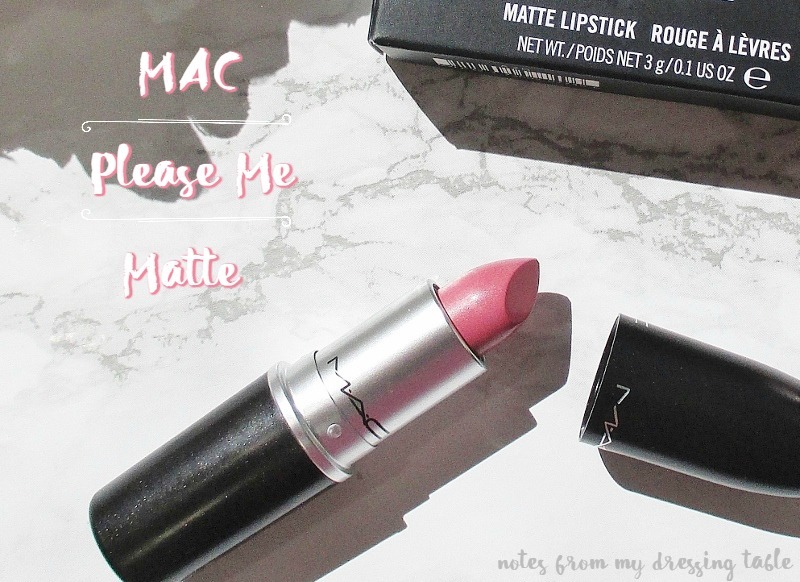 As a matte, I was expecting this lipstick to feel stiff, dry and be a chore to apply to my lips. Instead, it was lovely going on. The texture is soft and pliant, application is smooth, tug free and I had an even, opaque finish in just a few deft strokes. Okay, so far, so good. But what about wear? Wear time on this lipstick is very good. This baby hung in for hours, I'd say a solid four before I had to touch up in spite of my tendency to smush my lips and my constant slurping on coffee and Crystal Light. Impressive, indeed! Oh, this lipstick stays put very nicely. I forgot to apply my customary barrier pencil before application and at the end of the day, there was only the barest minimal feathering into those annoying little vertical lines around my lips. Nice! The feel is soft, velvety plush, surprisingly hydrating and amazingly comfortable. I balmed up well while applying my makeup, blotted it just before application and wore this lipstick all day, including a touch up or two. I honestly expected my lips to be dried out, traumatized and in need of intensive therapy and a recovery period after that first wearing. Nope. Didn't need it. My lips were just fine. Can it be? Have I finally met a matte lipstick that I can wear, enjoy and not have to recover my lips for days, afterward? The happy answer is, yes. Isn't this a pretty colour? I love how pillowy and plumped this lipstick makes my lips look and how surprisingly comfortable it is, for a matte - okay, soft satin matte - finish. Well done, MAC. Well done, indeed. Now I need to try other shades in this finish. Flocking Fabulous (this shade is no longer available but there are similar shades in the line) is a Cremesheen in a bright, happy coral. I adore this lipstick! The soft, silken, slippy formula is hydrating and so. ultra. comfortable. Almost balmy comfortable. Application is gorgeous, this lipstick slips effortlessly into place in just a few soft strokes. The finish is a soft gloss, opacity tends to on the sheer side of creme. This lippie lets my natural lip tone shine through just a little bit, making this a truly personal-to-me coral. Did I mention that this lipstick is insanely comfortable? Because this is a silky, slippy formula, wear time isn't stellar. I keep this one close at hand for regular touchups and I need to be sure to use and maintain my barrier pencil line to keep this stuff where it belongs. Damn! This lipstick is nice! The colour is right in my happy little wheelhouse and the comfort level is off the charts good. I will definitely be adding more Cremesheen lipsticks to my life. 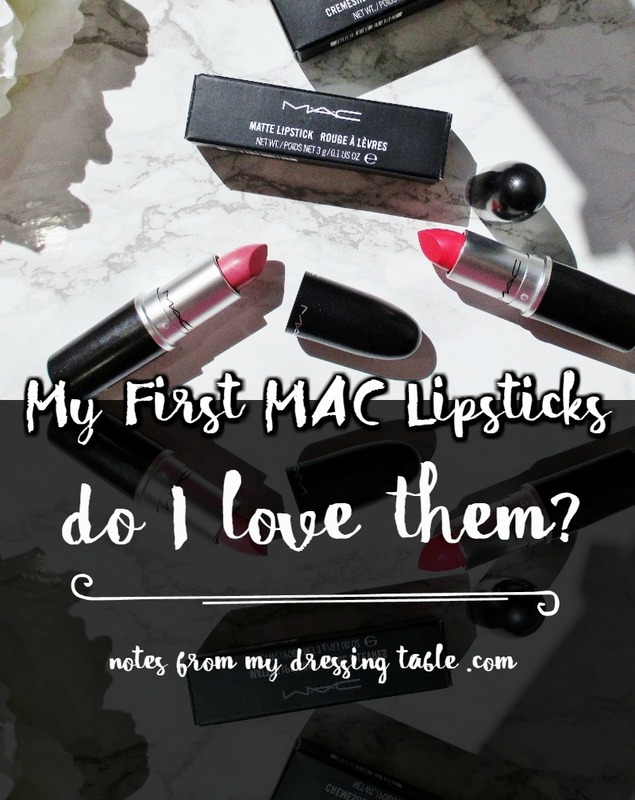 Do you know what I really love about MAC Lipsticks? That soft, slightly sweet natural vanilla scent. Oh, my. Now I get the hype, the love, the adoration for this brand's lipstick. If the two I bought are indicative of the rest of the line's lippies I'm hooked. MAC has a new customer in me, for sure. What are your favorite MAC lipstick shades and finishes? Enable me! I want more.